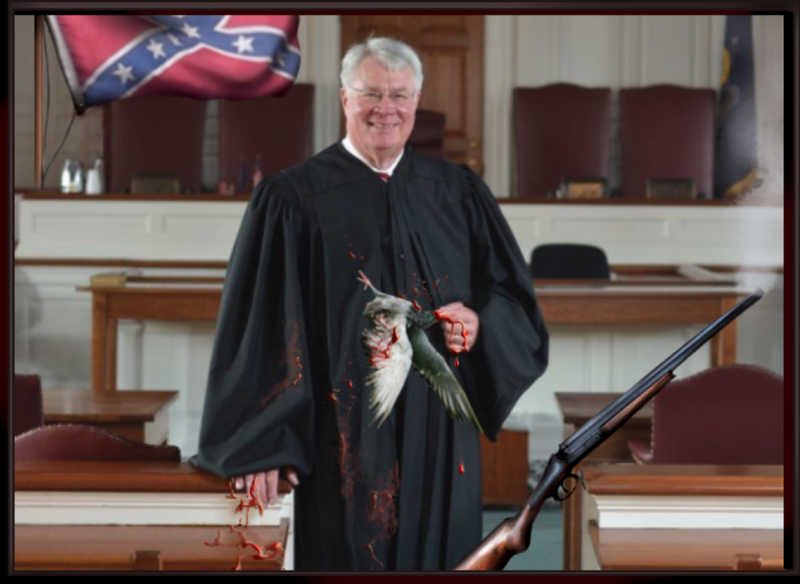 Adolph Antanavage is a lawyer and long time pigeon shooter who has recently been appointed to be a judge in the Court of Common Pleas in Berks County, PA. We've already exposed how Antanavage has been filmed shooting pigeons in front of a Confederate flag at a private killing club. Now we are exposing Antanavage for the other illegal activities he has either witnessed or participated in at pigeon shoots. Our rendition of what Adolph Antanavage's judge portrait should look like. In our new video, we call for Antanavage to be questioned under oath regarding illegal activity committed at live pigeon shoots he's attended. We are calling for him to be dismissed as a judge. Please politely contact Pennsylvania Governor Tom Corbett (who personally nominated Antanavage to a judge) and the President Judge of the Court of Common Pleas for Berks County and ask them to hold Judge Antanavage accountable for his actions. Please let us know if you get any response and please cross post and forward this email! This weekend SHARK will be heavily engaged in fighting against a two-day live pigeon shoot at the Wing Pointe canned hunt club! We will be handing out flyers and educating the public. In an extraordinary poignant turn of events, the Reading Public Museum is holding an event remembering the 100th anniversary of the death of the last passenger pigeon. SHARK will be there educating the public about how on that very day vile shooters are slaughtering hundreds if not thousands of pigeons in the same county.